Parent Guild President, Sara Warren, presents Mr. Gregg with a token of appreciation. 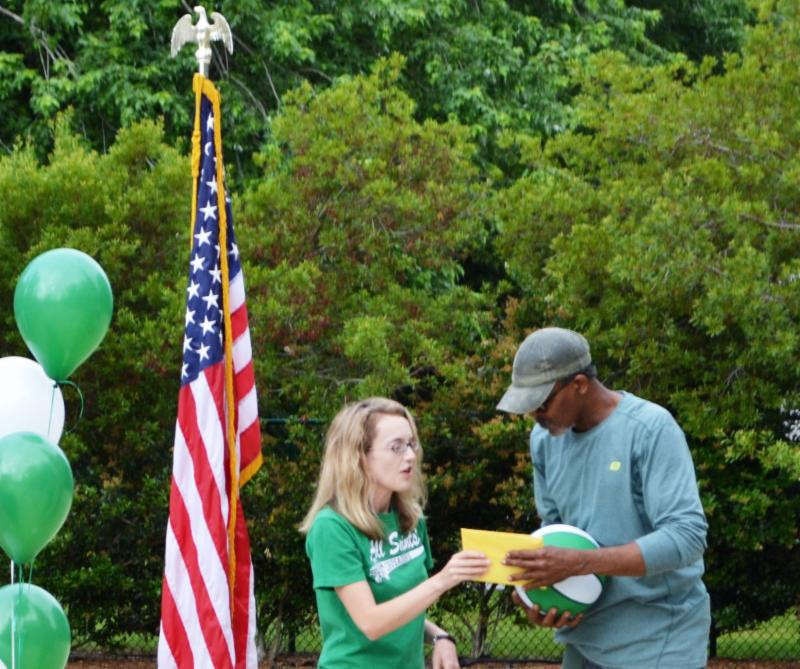 Parent Guild President, Sara Warren, presents Mr. Gregg with a token of appreciation at Tuesday's dedication of the "It's All Good!" playground project. Mr. Gregg makes the first shot! Students, teachers, staff, School Board members gathered to honor Mr. Gregg and show appreciation for all he does at All Saints'. Thanks to everyone for supporting the Parent Guild's primary 2017-18 fundraiser, Boosterthon, which made the playground projects possible. Praise for our Parent Guild! It has been a great year with the support of the amazing Parent Guild! Thank you to all families for being a part of this wonderful team of volunteers and for supporting the various fundraisers and events throughout the year. Please click HERE or contact the School Office.